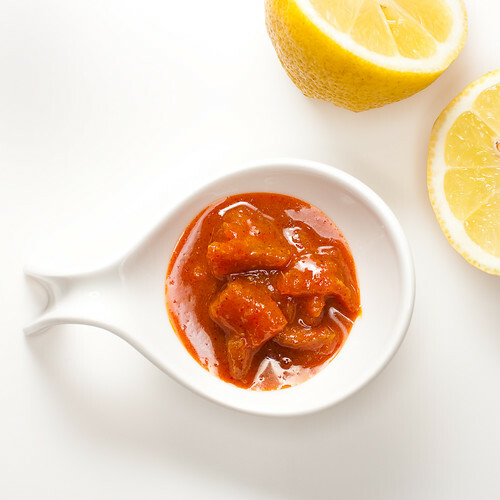 This is a fantastic pickle recipe - sweet, sour and spicy all at the same time. I also love the fact that the cooking process requires a hot, sunny day. During the summer months I keep an eye on the weather forecast and as soon as I see a heatwave on the horizon I start collecting fresh juicy lemons. The preparation is very quick and simple - the time is in the natural drying process. Personally I'd like to know who came up with these methods so that I can shake their (probably skeletal) hand. Place the lemons in a pan and cover them with water. Place a lid on the pan and bring the water to a boil. Let the lemons simmer until they are very soft - in the region of 20 minutes. Drain the lemons and let them cool until they are easy to handle. Now cut each lemon in half lengthways. Cut each half into three or four strips and then cut each strip into bit sized pieces. Arrange the lemon pieces on a plate and place them in the sun to dry. They are ready when the skin has become slightly firm and you can see the sugar from the lemon starting to crystallize on the surface of the skin. There should still be some moisture in the lemons as you don't want the pickle to be too tough. The length of time this will take depends on the weather and the size and variety of lemons. I made these on a glorious sunny day and they had finished drying within 4 hours. Now place the dried lemon pieces in a mixing bowl and add all of the remaining ingredients. Stir well. Taste the pickle and add more chilli or salt if required. Cover the bowl with cling film and leave to one side. Give the pickle a quick stir if you are passing by. You will notice the consistency of the pickle change with time. It is ready when the sugar has dissolved completely and the mixture is runny. Again the time this will take depends on various factors but don't be surprised if it takes 2-3 days. When it is ready, place in a clean dry jar and store in a cool, dark place - but not a fridge as it will cause the sugars in the pickle to solidify. one question: what is asafoetida?? Ooh lotus root pickle sounds interesting. Korean I presume? Hi Reena! I had good luck today. When I got home the sun was shining and it was still around 40°C warm/hot. So I cooked the lemons and put them into the sun for 2 hours. Looks like it was enough for them to crystallized. Also I could find asafoetida in an indian shop in Basel. So fingers crossed, that it turnes out great ;-) What do you eat it with? Meat? I have always wanted to make lemon pickles but always decided before even trying that it would be too demanding of a task; you have convinced me now to try it as the sun will be doing most of the work! Reena I love that you believe the sun will shine again in London! Beginning to wonder myself. Great blog, I will try some of your recipes and let you know how i get on. Enjoyed meeting you at FBC - hope we do again.